The registration fee for 6 days is 10,000 Naira. So the other day we had a meeting with Dr. Jonathan Pershing, Special Envoy for Climate Change at the U.S. Department of State. Who previously served as the Senior Climate Advisor to the U.S. Secretary of Energy and the Principal Deputy Director of the Office of Energy Policy and Systems Analysis at the Department of Energy. So we went from the challenges of Climate Change: Rise in temperatures, sea level rise, drought, concentrated rainfall, increase in ocean temperature and how it affects the sea nutrition, reduction in ground water and increase in salt water which affects agriculture mostly for people around the plain ground and the increase of disease because water and temperature rise. Beyond the above mentioned few problems of Climate Change, we also talked about the soc-economic opportunities in Climate Change like Climate Financing and Capturing Methane a very powerful greenhouse gas to produce electricity, heat buildings or power heavy trucks etc. Solar Energy; solar panels, windmills etc, we need more water to cool off most water plants, this and more can be powered by solar energy. Sustainable Skills; Young people getting involve, learning skills in solar energy productions and installations, smart designs like smart homes and training in creative up-cycling skills. These and more are a few of the many opportunities other countries are involved since our economy is in recession, maybe our leaders should begin to look into these opportunities as an alternative economy and career path for young entrepreneurs. International Institute for Creative Development Artists residency is created to investigate, amongst other important things, the thought process of creating. 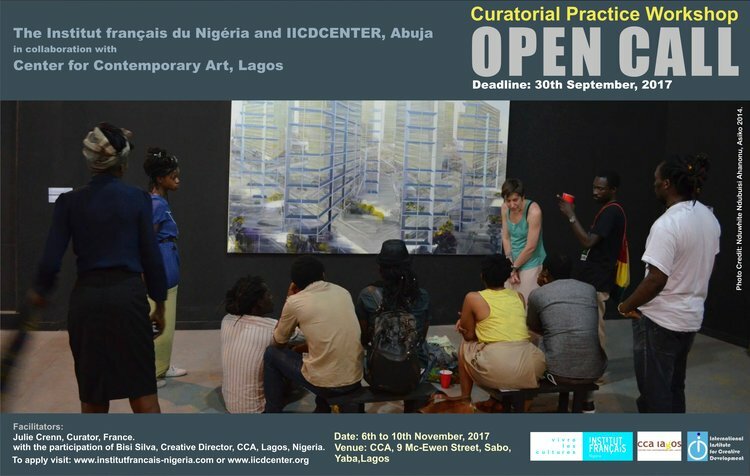 It is an open minded-thematic programme that focuses on the artist’s insights, narratives, and trajectory in the creation of art. Designed to facilitate a hybrid co-creating environment for local and international artists coming together to share experiences and creativity. Curated by multiple curators unlike other residencies, participants get to explore personal ideas and techniques in a shared space, exposing and connecting their creative energies in a collective frequency that leads to discovering new ideas, and establishing new frontiers of knowledge and creativity. This year’s residency will challenge your creative ideologies in an intense learning environment, as artists would be exposed to works of other artists, creative journals, and studios, aimed at building your creative vocabulary, narratives and presentation skills. Included in the programme are open studios, artists’ talks, travels, studio visits and final exhibition. At the end of one month, we believe that participating artists would have realized deeper and new understanding of their creative thought process, its challenges and dynamics, it’s role in our contemporary society, how socio-political global issues relates and influences our thoughts, how best to interpret them in form of social inventions, in realizing our ability to juxtapose metaphors that align with their true creative proclivities. In 2015 the International Institute for Creative Development, Abuja began the first and only innovative artists residency in Abuja which explored the process of creating and the idea of juxtaposing opposite metaphors, like South and North, displacement, and proximity, location and movement, object and the subject; all coming together to bring about a fusion of ideas by the three artists in residence. Considering the creative landscape of Abuja, the aspect of context in-depth and art education, research and critical thinking process and methodologies are not popular dialogue or artistic practice. The residency bridges the gaps and guaranteed continued cultural and civil interaction between the artist and his audience, who are constantly seeking and demanding for something new. The programme was also designed to bring together the artists, the creative audience and the public with its open studio events. The residency as a platform for creative investigations and interrogations of the wider society was able to create new spaces outside the white wall, attracting local, regional and international attention in line with the Institute’s objectives. The residency is designed to inspire critical thinking, development of contextual works, adopting learning experiences , that examines individual narratives with flexible structures that encourage research and creative production of individual ideas in a conducive working environment. We welcome Applications from local and International Artists (Female and Male). ■ Applications are open to all artists (including self-taught artists) who have been professionally active for at least 5 years. All Participants MUST be available for the full 30 days. Please do not apply if you cannot attend the entire programme. ■ Residency will be conducted principally in English. All Participants should be able to interact in English language. International Institute for Creative Development (often referred to as IICD) is a capacity building centre that provides a sustainable creative database, advocacy, providing technical assistance for creating and managing cultural exchange programmes that seek to advance cultural diplomacy and social development.